This photo of the end of 2012, shows the high degree of temperature safe site. At this time, the basement of the Yellowstone National Park stands at a record pace. In fact, it amounts to a rate of about three centimeters per year. 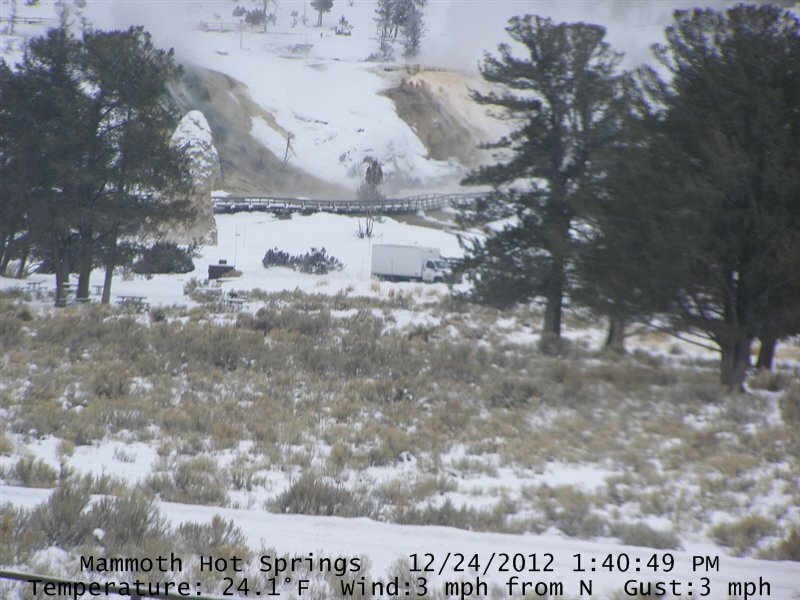 The reason this is so concerned that the park is under the Yellowstone super- volcano – largest North American volcano. Scientists tell us that it is inevitable that between erupt again someday, and when that happens the devastation is almost unimaginable. 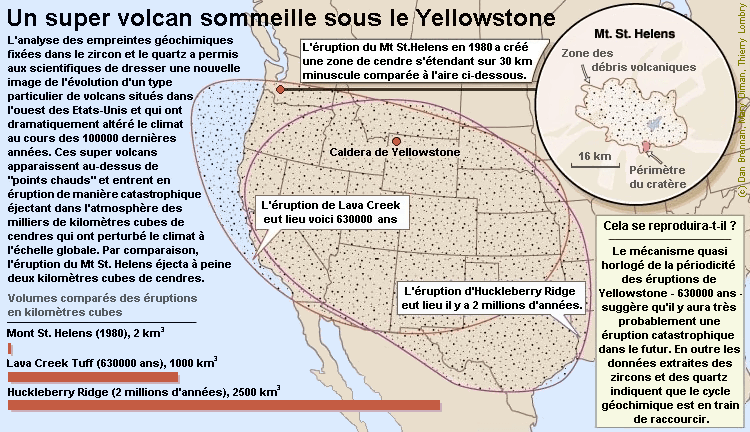 Complete eruption of Yellowstone send a thick layer of volcanic ash up to 1,000 miles away, and it would make much of the United States uninhabitable. When most Americans think of Yellowstone, they tend to conjure up images of Yogi Bear and » Old Faithful » , but the truth is that sleeping under Yellowstone volcanic beast that could destroy our nation into a single day, and now the beast begins to awaken . The Yellowstone Caldera is one of the most impressive creations of nature and sits atop the largest volcanic field in North America. Its name means « pot » and it is formed when the earth collapsed following a volcanic explosion. 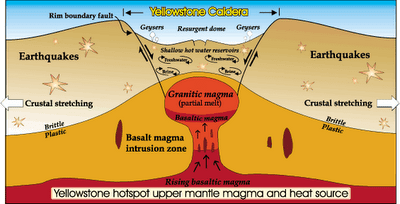 In Yellowstone, some 400 miles beneath the surface of the Earth is a « hot spot » of magma that rises to 30 miles underground before spreading over an area of ​​300 miles through the geological layers. At the top, but always under the surface, is the dormant volcano that. Geographical limits of the caldeira. When most Americans think of volcanic eruptions in the United States, they remember the catastrophic eruption of Mount St. Helens in 1980. But this eruption would not even worth comparing to a full eruption of the Yellowstone supervolcano. 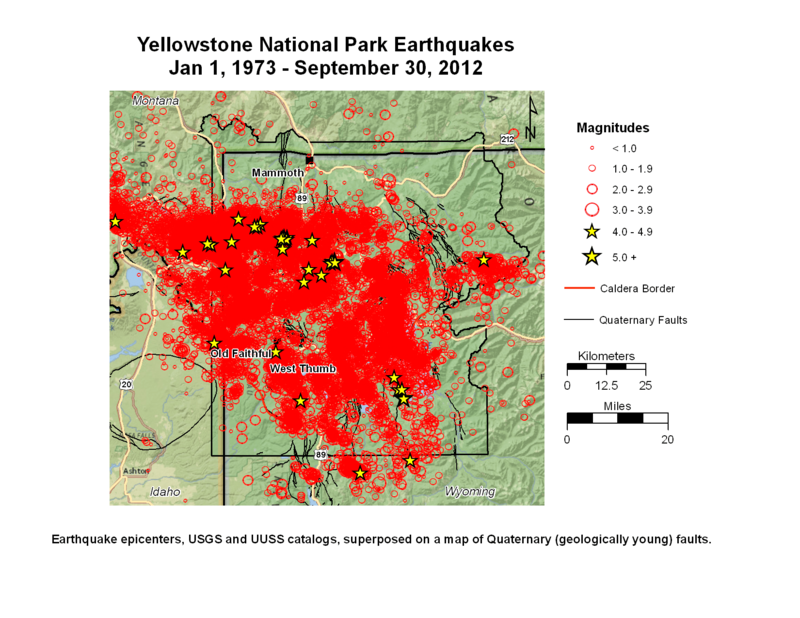 Until recently, Bob Smith had never witnessed two successions of earthquakes simultaneously with its 53 years of monitoring seismic activity in and around the Yellowstone caldera. Now Smith, a professor of geophysics at the University of Utah, saw three estates of both earthquakes. The thrust of the large lava lake in the caldera announcement likely death of our civilization. The extreme limits of the Great caldeira. So what’s the worst case scenario? If it had exploded, it would with a force more powerful than the Mount St Helens in 1980 thousand times. While spewing its lava far into the sky, a cloud of toxic ash assassinate all the vegetation on the ground, in a movement range and everything would be covered by a good 10 feet in hot acid and layer depth of up to 1,000 miles there. Two-thirds of the U.S. could become uninhabitable as toxic air sweep through it all , land and thousands of flights were canceled and millions of people were forced to leave their homes. Can you think of another potential disaster that could do the same thing ? # 1 A large-scale eruption of Yellowstone could be up to 1000 times more powerful than the eruption of Mount St. Helens in 1980. 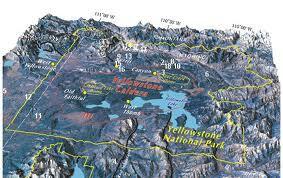 # 2 A large-scale eruption of Yellowstone could spewing volcanic ash up to 25 miles in the air. # 3 The next eruption of Yellowstone seems to be getting closer with each passing year. Since 2004 , some areas of Yellowstone National Park increased by not less than 10 inches in height. 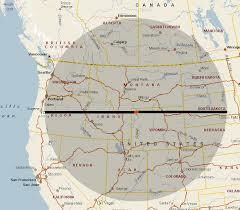 # 4 There are about 3,000 earthquakes in the Yellowstone region each year only. 5 In the case of a large-scale eruption of Yellowstone, almost all north -west of the United States will be completely destroyed. # 6 A massive eruption of Yellowstone would mean that almost everything in a 100 mile radius of Yellowstone would be killed immediately. # 7 A large-scale eruption of Yellowstone could potentially pour a layer of volcanic ash that is at least 10 feet in height up to 1000 miles away. 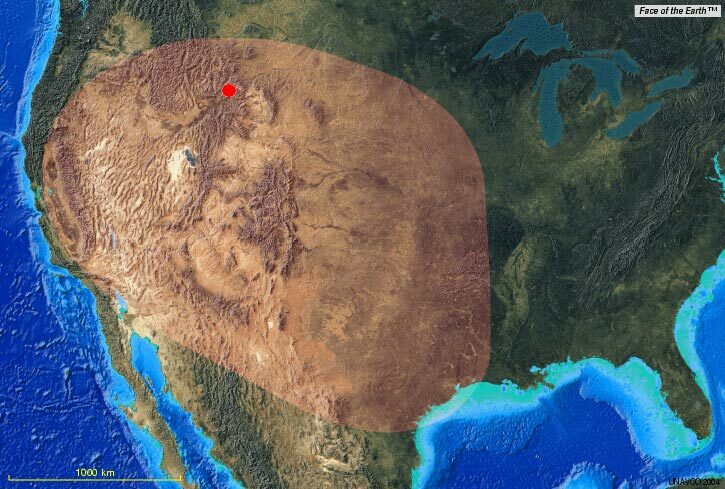 # 8 A full-scale eruption of Yellowstone could cover almost all of the Midwestern United States with volcanic ash. Food production in America is almost completely destroyed. # 9 A » volcanic winter » would be caused by a massive eruption of Yellowstone , which could drastically cool the planet . Some scientists believe that global temperatures could drop to 20 degrees on a global scale . # 10 America would never be the same after a massive eruption of Yellowstone. Some scientists believe a major eruption of Yellowstone would make two-thirds of the United States completely uninhabitable . # 11 Scientists tell us that this is not a question of « if » Yellowstone will erupt , but « when » the next inevitable eruption will occur. From the eruptions of the pas,this complete surface was recover by many meters of ashes. What makes all this even more alarming is that a number of other prominent volcanoes in the world are to go right now as well . The volcano is currently in the midst of an extremely active phase. According to the International Business Times , the volcano recorded 39 exhalations in the past 24 hours. An eruption earlier this month has caused several cancellations of flights in and out of Mexico City . The BBC notes that officials have raised the alert yellow alert level after the eruption of Popocateptl Saturday morning. Yellow is the level of warning for third at seven-step scale of the city. And an article by NBC News from August 2013 noted that one of the most dangerous volcanoes in Japan came erupting 500 times so far in this year 2013! Ash floated as high as 3 miles above the volcano Sakurajima in the southern city of Kagoshima on Sunday afternoon , forming its highest since the plume Japan Meteorological Agency began keeping records in 2006. Lava flowed just over half a mile of the crack , and several huge volcanic rocks tumbled down the mountain. Although the eruption was more massive than usual, the inhabitants of the city of about 600,000 inhabitants are accustomed to hearing the mood swings of their neighbor to 3,664 feet. Kagoshima officials said in a statement that the eruption was the 500th of Sakurajima in this year alone. We are now entering a period where volcanic eruptions become much more common in the world? Could we be fast? Approaching the day … absolutely devastating volcanic eruption will cripple much of North America? I hope not, because it could easily spell the end of the human race … a strong part , at least .